Trying to get back into the swing of this. I recently came across a blog called Vintage Booze that’s doing the same thing I am, although they’re mostly covering ads from the 1960s onward. I’m interested in tracing brands that have survived to today and those that haven’t, while looking at the way alcohol branding has changed over the decades since Repeal, so I’m taking a deeper view. Besides, a good idea’s a good idea, and it doesn’t bother me that someone else had the same good idea. 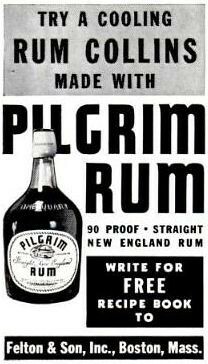 Speaking of dead brands, here’s one that really interests me: Pilgrim Rum. At the end of Prohibition, several companies tried to revive the centuries-old tradition of New England rum. 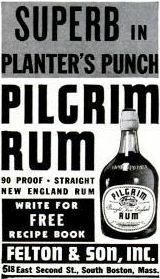 One valiant effort was Pilgrim rum, whose efforts to evoke Yankee history did not work out in the marketplace…. By the modern age, only Felton was left of the New England rums. In 1983, the plant was sold and mothballed, and so ended the tradition. The building still exists. Renamed The Distillery, it’s now an artists community. There’s a great and thorough history of the building on their website. Here’s another great example of a defunct brand that I’d really love to try sometime, just because I’m so curious about how it tasted. My god, Tales didn’t kill me after all. Jim gave a condensed version of his talk at Tales, when he and Charlotte Voisey gave a presentation on the botanicals in Hendricks gin. Jim discussed the use of spicy elements in the Hendricks botanical base, and spicy ingredients in cocktails. One highlight was the La Luna cocktail, a blend of gin, lime juice, cucumber juice, jalapeno syrup, soda–a delicious drink that I tried in the Botanical session and was happy to see at Newport, because I knew Jen would love it. Jim also had an assistant pass around a tray of botanicals, tins of juniper berries and other spices, alongside vials of the same botanicals in distillate form. Monday, I flew solo and attended the M.S. Walker Wine Experience, a wine-and-spirits tasting put on by M.S. Walker, a distributor in Rhode Island and Massachusetts. I focused mostly on tasting spirits since I knew there were a few new things I wanted to try. Chief among them was the new spiced offering from Chairman’s Reserve Rum, made by St. Lucia Distillers and imported into the United States by Team Spirits Imports Company. That latter group was repped at the show by its founders David Jones and Clyde Davis, and I had a chance to speak to David at some length about how the spiced is made. First, I have to say this: I normally hate spiced rum, and David put a finger on why–it’s often overloaded with vanilla. And yes, I’ve found that to be true, but there’s more. I just don’t think the spices make any sense. I can rarely distinguish anything other than clove and maybe nutmeg. And the damn things are always so overly sweetened. Gross. Man, I really loved this stuff. I told David it was like sipping a well-made rum old-fashioned. Or, even truer, sipping a pseudo-OF. One thing I sometimes enjoy is using a small bit of liqueur or other sweetening agent in place of sugar (or simple syrup) in an OF. So I’ll sometimes take 3 oz. of a good sipping rum, splash in about a teaspoon of Allspice (Pimento) Dram, and dash on some bitters. The Chairman’s reminded me a lot of that. Now, the Team Spirits guys had the Chairman’s Spiced at Tales, from what I’ve heard, but the one time I saw it was in a Tasting Room, and their table was always so mobbed I couldn’t get close to it. Everyone there seemed to love it, too. Look for Chairman’s Reserve Spiced Rum to come to market in September.